Hydro Power is one of the largest sources of energy, accounting for roughly 20% of the worldwide demand of electricity and for well resourced countries it accounts for majority of the energy. Compared to other sources of Energy, Hydroelectric Power is one of the cheapest, non Carbon Emitting, non Polluting and Mature Energy Sources. Hydro Power plants have been developed to almost full potential in developed countries because of their superior characteristics and many more are being constructed by developing countries like China and India. Like Wind Energy, Hydropower Energy is mostly used for electricity generation and accounts for almost 20% of the total global electricity production. Another major but mostly unknown use of hydro power is for storing energy. Using the existing dam infrastructure, utilities use hydro power to store energy which is known as “pumped hydro storage”. This use is becoming more important as there are limited options for cheap energy storage. In olden times hydro power like wind power was used for agricultural use like processing grain wherein the kinetic energy of the moving water was converted into mechanical energy. However this use has almost disappeared. 1) Electricity – Hydroelectricity is one of the most important sources of energy in the world. Hydroelectricity is one of the cheapest and non-polluting sources of power. Though it can cause ecological damage initially it has better climate compatibility than other major forms of energy like nuclear, coal, gas and others. Many countries in the Nordic region and South America are almost completely dependent on hydro power for their energy needs. For some countries like China and India with massive energy needs, Hydroelectricity is the only option currently amongst non-global warming energy choices to build in large capacities. b) Accommodation of Intermittent Sources of Energy – Solar Energy and Wind Energy are growing at a scorching fast rate of 50% and 30% CAGR over the last several years. Larger share of these forms of renewable energy in the Electricity Mix is driving the growth Grid Storage. 3) Agriculture – Hydropower was used in ancient times for producing flour from grain and was also used for sawing timber and stone, raised water into irrigation canals. 4) Industry – Hydropower was used earlier for some industrial applications such as driving the bellows in small blast furnaces and for extraction of metal ores in a method known as hushing. Hydroelectricity power plants are the biggest power stations in the world dwarfing the biggest nuclear and coal power projects. The world’s biggest power plant is the Three Gorge Dam in China which at 22.5 GW is more than 50% larger than the 2nd biggest power station in the world. 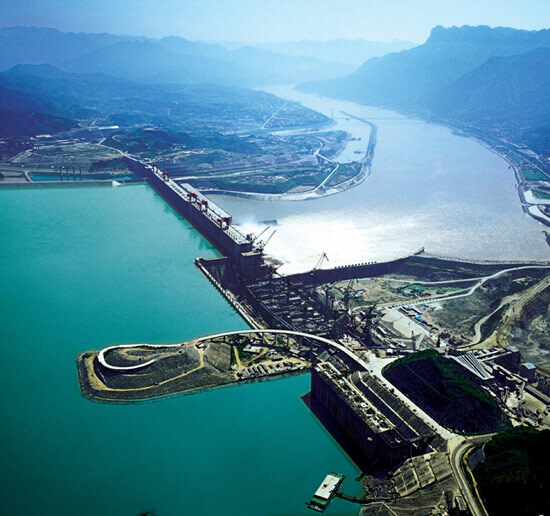 1) The Three Gorges Dam world’s largest capacity hydroelectric dam in the world with a capacity of around 22.5 GW. The 3 Gorge Dam has an astounding 26 Turbines of 700 MW totaling 18.2 GW which were completed in 2008. The plant is expanding further to 22.5 by 2012. The Dam has been very controversial with both opponents and proponents. The Dam displaces a lot of people and resulted in flooding of historical sites. However its pluses are that it has increasing flood control and increased the shipping capacity of the Yangtze river. 2) The Itaipu Hydroelectricity Power Plant on the Brazil is the second largest power plant in the world. With 20 generator units and 14,000 MW of installed capacity, the Dam was completed in 2003 making it the biggest in that time. 3) The Guri Dam in Venezuela is the 3rd biggest hydroelectricity power plant in the world with a capacity of 10.2 GW. The Hydroelectric Power station Guri was constructed in the Necuima Canyon, 100 kilometers upstream from the mouth of the Caroní River in the Orinoco. The Guri dam alone supplies 73% of Venezuela’s electricity. China is the by far the world leader in hydro power plant capacity with around 200 GW which it aims to double to around 400 GW by 2020.Other major hydroelectricity countries are Canada, USA, Brazil and India. How much does Hydroelectricity cost? The costs of hydroelectricity are not a simple function of dollar costs.It should also take into account the massive displacement costs in case of massive hydro dams, the loss of ecology and potential tails risks which can lead to massive payments. Investment Costs are the biggest component of Hydroelectricity accounting for almost 75-80% of the total lifecycle costs of a hydro power station. The investment costs like all other forms of energy varies depending on the site, technology etc. In general it costs between $1-3 per watt of hydro electricity. Operating Costs of Hydel Power on the other hand are considerably lower as Hydro Electricity does not require any fuel except for water which is freely available. However it does not plant operators to monitor and maintain hydro power plant parts like turbines etc. No Greenhouse Gas Emissions/Air Pollution – Hydroelectricity does not produce any GHG emissions or cause air pollution from the combustion of fossil fuels unlike coal, oil or gas. This makes them very attractive as a source of cheap, non carbon dioxide producing electricity. Energy Storage – Pumped Hydro Storage is possible with most of the hydro power plants. This makes them ideal storage for wind and solar power which are intermittent in nature. Hydro Dams can be modified at low costs to allow pumped storage. Small Size Possible – Hydroelectricity can be produced in almost any size from 1 MW to 10000 MW which makes it very versatile. Small Hydro Plants are being encouraged by government as they cause less ecological affects than large hydro plants. Even micro hydro plants are possible. Reliability – Hydro Power is much more reliable than wind and solar power though less than coal and nuclear as a base load source of power. Hydroelectricity is more or less predictable much in advance though it can decrease in summer months when the water is low in the catchment areas. High Load Factor – The Load Factor for Solar and Wind Energy ranges from 15-40% which is quite low compared to Fossil Fuel Energy. Hydroelectricity on the other hand has a load factor of almost 40-60%. Long Life – Hydro Plants have a very long life of around 50- 100 years which is much longer than that of even Nuclear Power Plants. The long life implies that the life cycle cost of a Hydel Power Plant becomes very low in the long term. This was really helpful because I could not find another site that would tell me what you could power with hydroelectricity.